♚Perfect Gift: Ring is the Perfect Gift to Your Daughters, Granddaughter or Young Girls etc. Cute and Pretty Rings Suitable for Valentine's Day, Holiday, Ball, Party, Graduation, Birthday or Any Special Occasions, Never be Clueless about Your Gifts Again! 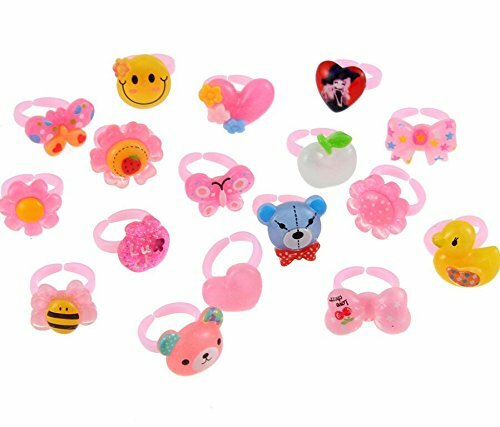 ♚Though These are Extremely Delicate and Easy to Wear, Still We Would Recommend Girls Aged Above 3 Plus Should Try These. It is suitable for daily wearring,wedding ceremony,party,or any some occasions. Made of environment-friendly polymer resin,smooth and safe for children to play with. Adjustable ring bands,never have to worry about kid #39;s finger getting stuck. If you have any questions about this product by Zhahender, contact us by completing and submitting the form below. If you are looking for a specif part number, please include it with your message.